The overall idea of this sequence is to statistically compare two or more SST data sets. The data sets are assumed to consist of 2D SST fields in time; i.e., each field is a lat, lon field, one for each instant in time, with many time steps. 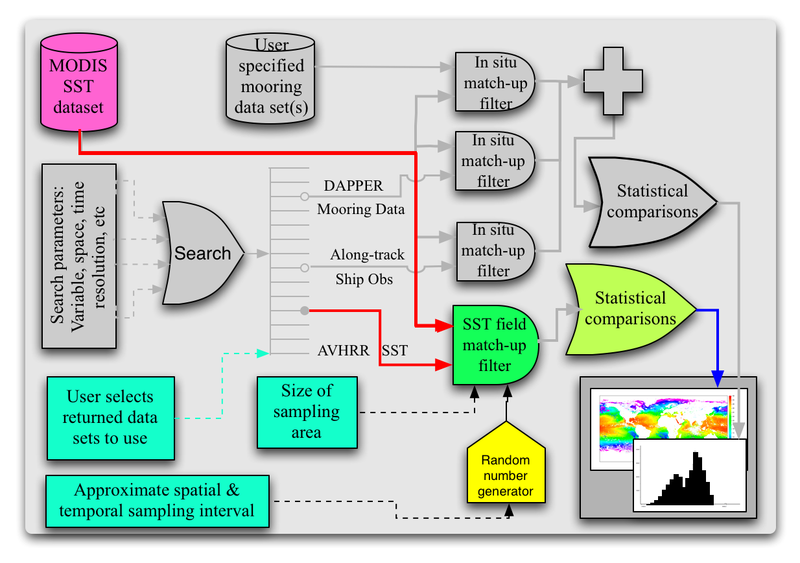 (This workflow compromises the colored elements of the modified ocean use (Figure 1) shown in the proposal.) 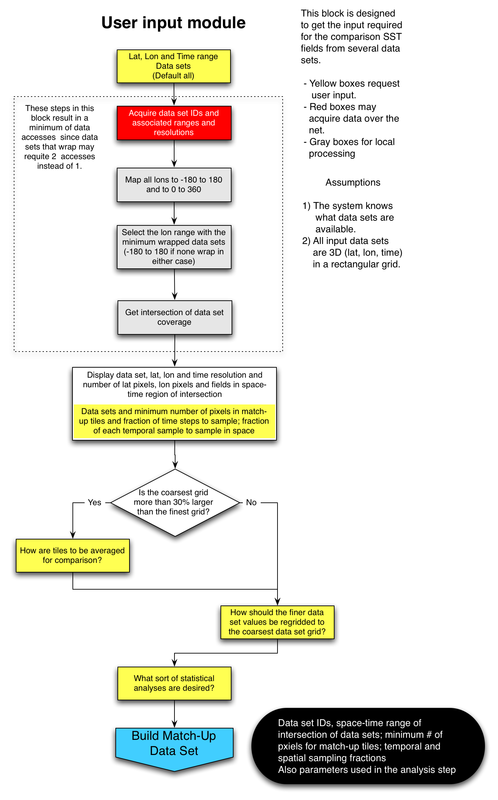 Although this workflow is designed to compare SST fields, it should work for many geo-based arrays. SST fields could be compared point-by-point, but for many data sets this would result in a VERY LARGE computational problem. The solution adopted here for large data sets is to randomly sample the fields in space and time and then to compare samples statistically. The user, based on data set characteristics, specifies the fractions in space and time of the data sets that are to be sampled. The selection process is outlined in the User Input Module. The data sets are then randomly sampled based on these fractions. An additional complication is that the grid spacing may differ between data sets. In order to address this, the size of each sample is based on the area of the coarsest grid; i.e, the area sampled for each data set will be the same, but the number of samples will not be. 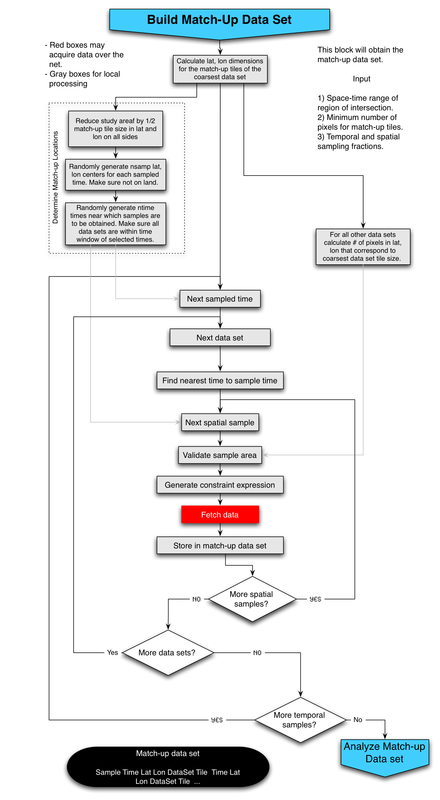 Sampling is described in the Build Match-Up Data Set Module. In the analysis phase decisions must be made on how to compare arrays of different size. These decisions will be made interactively with the user and are discussed in the Analysis Module. Initially, the comparison simply provides mean and standard deviation of the differences. Later, one could imagine filtering the results by space and time. The first block of this module requests lat, lon, time ranges from the user as well as data sets of interest. 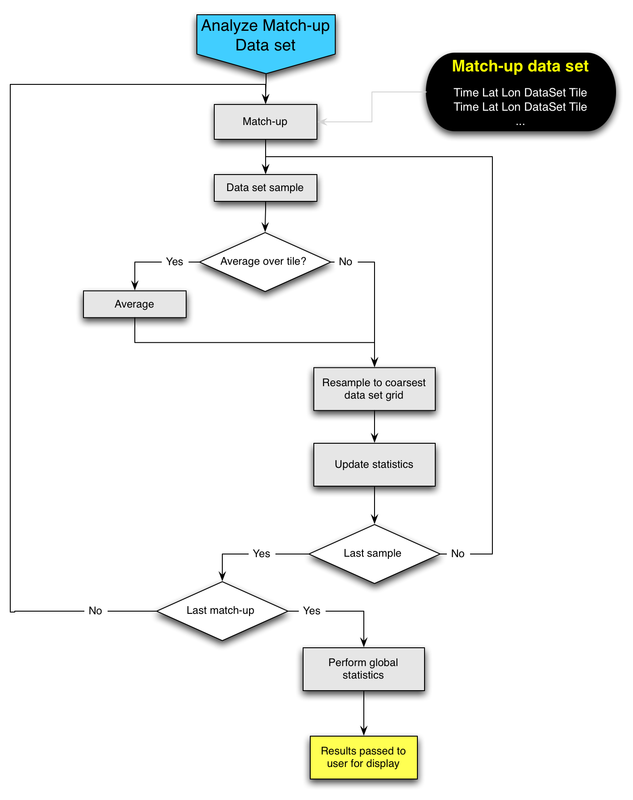 This could be done iteratively - the user specifies lat, lon, time, variable and resolution ranges and the system returns a list of data sets from which the user selects those of interest. The module then gets the metadata associated with data sets that meet the user's request. Because longitude can be specified on any 360 degree interval, it is possible that the ranges of data sets will not coincide. This could result in additional unnecessary requests when performing the subsampling that is required by subsequent module. For example, one may go from -180 to 180 and another from 0 to 360. When requesting data, if a user is interested in data between 170 and 190, these data would in general be accessible via one request (in time) for the 0 to 360 data set, but 2 requests for the -180 to 180 data set. In order to minimize, or preferably eliminate, the number of multiple requests from the same field, the next several blocks of code find the longitude range that minimizes the number of `wrapped' data sets. Once the data sets have been selected, their metadata is acquired and the need for additional input determined. First, the module requests of the user parameters to be used in the random sampling of the arrays for comparison. Next the module determines if the grid sizes are very different, defined here as 30%. If they are, then some sort of averaging of the finer grids up to the coarser grid size may be desired. The user is queried for these parameters. Finally, the user is asked what sort of statistical analyses are to be performed. Figure 2. User selection module. This block calculates where in space and time the samples are to be taken, the size of the area to be sampled for each data set and then acquires the samples and stores them in a match-up data base. The areas to be sampled are based on the size of the coarsest data set and the minimum number of pixels per sample passed in from the User Input Module. The first block in this module calculates this area and from that the number of grid elements in all other modules based on this area. The second block, labeled Determine Match-up Locations randomly determines the spatial and temporal location of the center of tiles for which match-up tuples will be obtained. Following generation of the location in space and time of the samples, there are three loops, one over time, the second over data sets and the third over space. The reason for this ordering of loops is that most SST data sets are currently 2D (longitude, latitude) fields in time. Also there will generally be many spatial samples for each temporal field sampled. So the module gets a field at a given time for the first data set, acquires all of the spatial samples for this time, data set pair, then goes to the next data set finding the nearest time and repeats until all data sets have been sampled, then it goes to the next instance in time. Figure 3. Development of the Match-up Data base. From this data set the user may calculate mean, sigma for all of the differences and each grid. This can be done globally, by match-up sample or by samples falling in a given space-time region. The user may also stratify by data set. There are of course higher order statistics that some may want to calculate, but I think that these simple stats will keep us busy. This page last changed on 26-Mar-2008 13:43:21 PDT by uid=altintas,o=SDSC.